Developer: How about 62 Stacked Townhomes? Wednesday’s meeting to discuss the latest development proposals for the old Beer Store property at 2059 – 2069 Weston Road was deja vu all over again. The developer, Jack Morelli from First Avenue Properties and Councillor Nunziata met with residents last October and the proposal at that time was for 38 townhomes on the site. One of the developer’s other properties, the old Post Office building at 2050 Weston has found a major tenant. A medical centre (relocating from Mount Dennis) will occupy the entire 20,000 square feet of the ground floor next Spring. The upstairs will contain 15 new apartments. 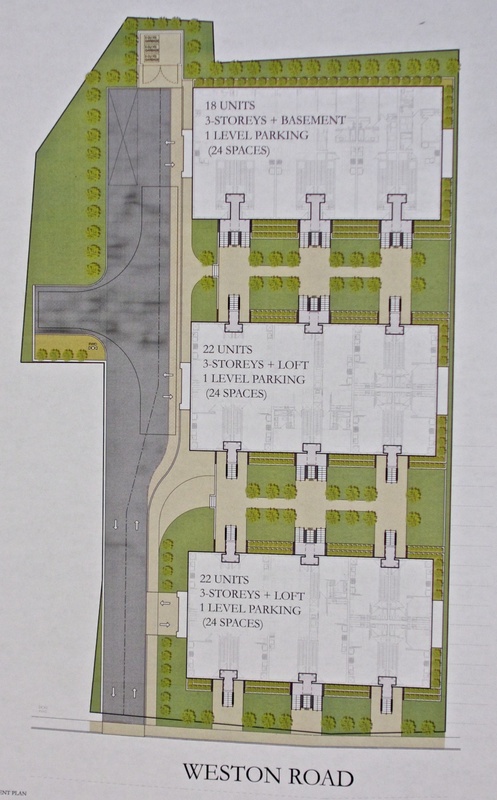 After being sent back to the drawing board by various city agencies, Mr. Morelli has returned with a revamped proposal that now consists of 3 buildings occupying a smaller footprint but containing 62 condominium stacked town homes (a 63% increase) measuring between 500 – 1300 square feet. Each of the buildings will contain 24 underground parking spaces; one per townhome and 10 extras for visitors to the 62 homes. The townhomes will form a frontage along Weston Road. Once again, the city (represented by Natasha Lang) will study the plans to see if they comply with city requirements. The developer stated that, ‘This is the new concept of town homes and it’s what people want’. He also justified building town homes instead of retail since it took such an effort to find a tenant for his retail space across the street, and besides, ‘There’s too much retail space in Weston anyway’, and, ‘Retail is out of the question’ (on the site). Apparently the MCR (not R2) zoning on the site allows an 8 storey building on the property. This was repeatedly hammered home by both the developer and Councillor Nunziata. MCR zoning permits a retail ground floor that could form the exterior of the project along Weston Road in keeping with the rest of the historical ‘Main Street’. All of this seems to be posturing. Mr. Morelli, like any developer, wishes to generate the largest amount of money from the site. He is not doing Weston any favours. To point out that he could put up an 8-storey building is an empty threat. If Mr. Morelli could make more money by erecting such a building, you can be sure he would do so. The people of Weston will be left with this development for many decades. Townhomes will be a classic case of bad planning along Weston Road in the middle of a retail stretch. While there is a demand for housing, any city planner will tell you that developments need to fit in with their surroundings. 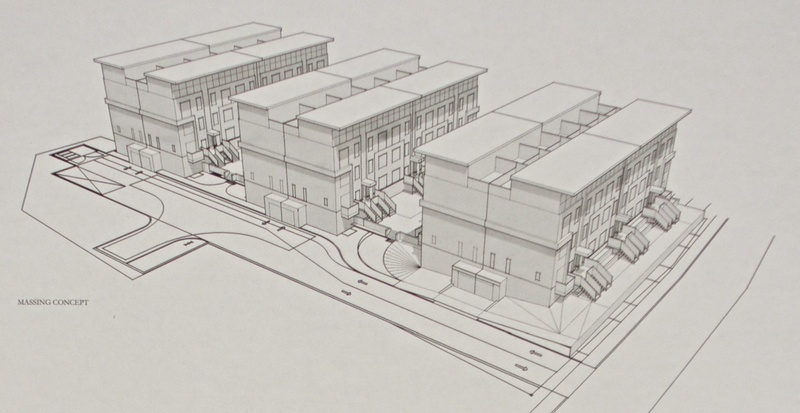 As currently proposed, these townhomes will look like missing keys on a piano or the gap in a hockey player’s smile. The proposed Weston Road Frontage. 3-D view showing the street entrance of the development. Plan view of the development. Mr. Morelli agreed to the formation of an advisory committee that would work to consider the wishes of area residents. This will be done in conjunction with the Weston Village Resident’s Association. Thank you for suffering through more of the same, only worse this time, and taking trouble to report on the meeting. The zoning favours developers, as always, and our councillor is along for the ride. Cant the Resident Association do something? What about the WCC or historical society? I don’t understand how this can happen. I think this is terrible idea. Does the WCC even exist anymore?